Eleven-year-old Jeremy Wilderson teams up with his rival crime fighter to stop the stealing spree that’s wreaking havoc on Scottsville Middle School in this action-packed MAX novel. Jeremy Wilderson is not a thief. In fact, he is his middle school’s one and only retrieval specialist. Confiscated cell phones, stolen lunch money—he’ll discretely retrieve it before the last bell rings. Business is good, and if it weren’t for the meddling of preteen private investigator Becca Mills, he’d be happier than a gym teacher on dodgeball day. But a new job shatters his comfortable lifestyle. 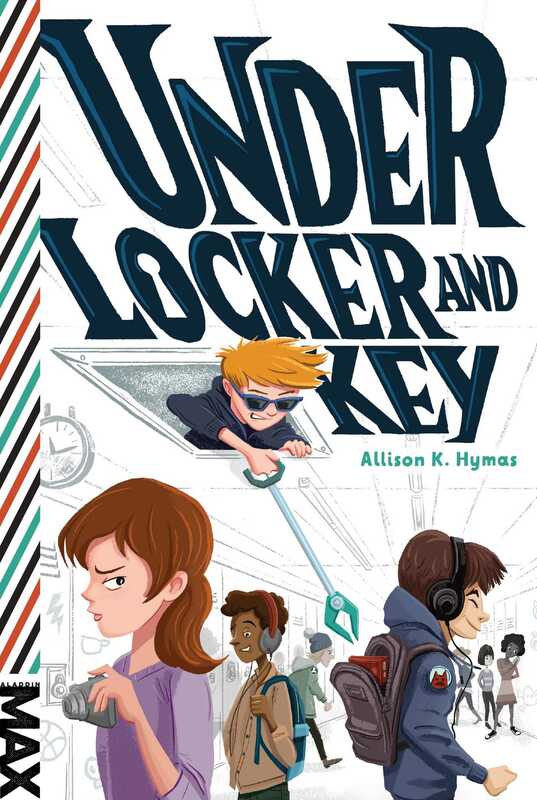 Now, thanks to Jeremy, the master key to the schools’ lockers is in the hands of an aspiring crime kingpin who doesn’t exactly have Jeremy’s strong moral character. Soon not even combination locks can protect the students’ textbooks and jackets. Retrieving the key is too big a job for one crime fighter, and only one person wants the key returned as much as Jeremy does: Becca Mills. Lockers are being robbed, the teachers are looking for the culprit, and the only person Jeremy can turn to is the girl who most wants to see him in the principal’s office. Will Jeremy be able to trust Becca enough to get the key back in the right hands? Or could he end up in detention until the end of high school instead? FIRST OFF, I AM NOT a thief. I am a retrieval specialist. Big difference. Thieves take what doesn’t belong to them. They steal. Me, I take back the things thieves steal and return them to their rightful owners. The job runs everywhere from crazy to boring to dangerous, but someone has to do it. Kids need protection from the jungle out there. If you’ve ever been in middle school, you know what I mean. Bigger kids rip sixth graders off for lunch money, new shoes, whatever. Even teachers contribute to the problem by confiscating cell phones and iPods. I have the highest respect for teachers—my mom is one—but they don’t always understand that the cell phone belongs to your dad, not you, and that if you don’t give it back right after school, you’re grounded. So I step in. One meeting with me over a cafeteria lunch or before class and I guarantee to return your stolen property before the late bus leaves. No payment needed—I just ask that you pass my name on to someone else who needs me. And don’t tell the teachers that I retrieved your stuff. Or Becca Mills. Especially Becca Mills. Still convinced I’m a thief? Read on. After you become more familiar with my method, you’ll change your mind. Where to begin? How about somewhere exciting . . . ? The tiles froze my bare knees as I knelt in front of the backpack. I’d like to tell you my heart raced and sweat dripped down my forehead, but I never get nervous on a job that routine. If anything, I felt annoyed at the school for pumping the boys’ locker room full of icy air. Why can I almost see my breath in the one room in school where people strip down? Anyway, the bag didn’t belong to me. But the Hello Kitty wallet shoved at the bottom sure didn’t belong to the owner of the tough-looking blue-and-black backpack with the X Games key chain. The client: Carrie Bethesda. First-chair trumpet in the concert band. Sixth grader with a habit of carrying multiple twenties in her wallet. Her parents trusted her with a month of lunch money at a time—a bad idea, as it turned out. The mark: Adam Lowd. Nothing out of the ordinary: eighth grader with a taste for after-school pizza that left him constantly short on cash. He’d lifted Carrie’s wallet during a scuffle in the lunch line, or so Carrie suspected. She was right. I found the wallet crammed between Lowd’s history textbook and a wad of old vocabulary tests. A quick check verified that all $43.75 was still there. This girl was loaded. All that cash might have tempted a real thief to pocket it and leave the client destitute, but I tucked the wallet, bills and all, into the pocket of my hoodie for temporary safekeeping. My watch beeped. Ten minutes until the end of eighth-grade gym; the students would come back at any minute to change out of their uniforms. Gotta love gym—the only class where you have to leave all your belongings in a room with minimal security. No one’s around while class is in session, and half the time, people forget to lock their lockers. On top of that, the gym lockers are so small that backpacks have to be left in the open, like Adam’s was. It’s like the school tries to make my job easier. I zipped Adam’s backpack and then left, one hand in my hoodie pocket, resting on the retrieved wallet. And because it’s written in the fabric of the universe that no job can go off without a hitch, with the whir and click of a camera Becca Mills stepped in front of me in the hall outside the gym. “Jeremy Wilderson,” she said, twirling her little silver camera by its strap. How did such a tiny girl manage to block the whole hallway? “Ms. Campbell let us go early after we promised we wouldn’t get into mischief.” A true statement. That camera wouldn’t give her anything on me. I sighed. I should have remembered: She’d memorized my schedule back when a history teacher’s test answers disappeared between fourth and fifth period, and Becca was certain I’d stolen them. It wasn’t me; the teacher remembered he’d left the answers in his car. The way Becca acted, though, you would have thought my innocence personally offended her. Becca’s gray eyes narrowed. Her hands lifted, reaching toward the slight bulge in my hoodie pocket. An actual frisking? Really? I turned and saluted her, which, judging by her scowl, she did not appreciate. The bell rang, and I hurried away down halls beginning to crowd with kids. I had to steer through the mess like a getaway driver at rush hour to get back to my locker and retrieve my own backpack. Yeah, I lied to Becca. I wouldn’t have to if she would loosen up and see that I provide a necessary service, instead of trying to put me in detention for the rest of my middle school life. Carrie was waiting outside the instrument room, fussing with her ponytail, biting her lip, and actually pacing. I shook my head. I had told her to go about her classes like normal, and she had to act like she stole the principal’s car keys (much easier than it sounds, by the way). What if Becca or Adam saw her like this? I beckoned her to follow me into the instrument room. The loud, busy instrument room makes a great place for handoffs. I use it a lot—band kids need my services more than most people. Instruments have so many loose parts, like reeds and slides and buttons, which have a knack for disappearing just before the winter or spring concert. In return for my help finding mouthpieces that cost way more than a month’s allowance, the band kids grant me a certain amount of discretion when I show up in their room. No one bothered me as I leaned into a corner and brought Carrie’s wallet out of my pocket. “You got it!” Carrie said. Or at least I think that’s what she said; some trombone player took that moment to run a scale. Before I could move, Carrie hugged me. When she let go, I spun on my heel and walked away. It happens a lot. A guy like me—athlete, hero—girls can’t resist. Allison K. Hymas holds an MFA from Brigham Young University and currently lives in Utah. She is the author of Under Locker and Key and Arts and Thefts.